Gene-editing has just achieved a new milestone. A food service company in the Midwestern region of the United States is now using an oil made from genetically edited soybeans in its sauces, dressings, and fryer. The company that makes the oil claims this is the first commercial use of a gene-edited crop — possibly signaling the start of a new era of healthier, cheaper food courtesy of genetic engineering. By using gene-editing technology to deactivate two genes found in soybeans, Minnesota-based agriculture company Calyxt says it’s created a soybean oil with no trans fats and more heart-healthy fats than traditional soybean oils. The company told the Associated Press that the oil also has a longer shelf life, which could decrease costs for consumers. Calyxt won’t name the restaurant using its oil, citing “competitive reasons” for keeping the information secret, but the news that anyone is using a gene-edited crop in the U.S. could spur others to follow suit. “This historical commercialization of the first-ever gene-edited food product is a testament that food manufacturers and consumers are not only embracing innovation, but also willing to pay a premium for products which are healthier and traceable to the source,” Calyxt’s Chief Commercial Officer Manoj Sahoo said in a recent press release. Gene-edited crops have thus far managed to avoid much of the controversy surrounding genetically modified organisms (GMOs), and for good reason — the two are very different. 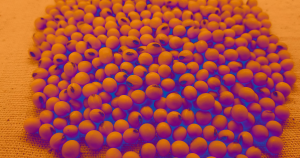 To create GMOs, scientists add desirable genes from one organism to the genome of another — a genetically modified soybean, for example, might include DNA from a bacteria naturally resistant to pesticides. When genetically editing a crop, on the other hand, scientists only delete or activate the crop’s own genes. In other words, the final product could appear in nature through mutation and natural selection. The U.S. Department of Agriculture announced in March that genetically edited crops don’t require any additional oversight. That means while Calyxt’s soybean oil might be the first gene-edited food to reach the U.S. market, it very likely won’t be the last.